A rapturous celebration of wild fun, quick love and the pleasures of New York City, On The Town is an infectious musical with a glittering cast. Three sailor friends have a 24 hour shore leave in New York. 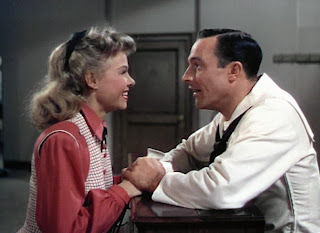 Gabey (Gene Kelly) wants to find the girl of his dreams, Chip (Frank Sinatra) wants to see all the sites, and Ozzie (Jules Munshin) is the overwhelmed sidekick. Gabey falls in love with the picture of the latest winner of the monthly "Miss Turnstiles" subway competition, and soon catches a glimpse of her: Ivy Smith (Vera-Ellen) is a simple girl from a small town, but Gabey thinks that she is a high society star. He is determined to catch up with her, and convinces Chip and Ozzie that they should help. 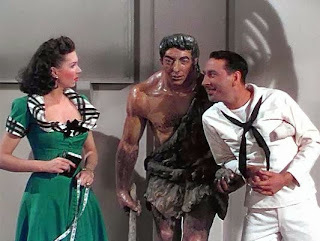 But as soon as they start their search for Ivy, anthropologist Claire (Ann Miller) bumps into Ozzie at the museum and is immediately enamoured with him, while determined taxi driver Hildy (Betty Garrett) sets her lustful sights on Chip. Ozzie and Chip abandon Gabey as they set off to have fun with Claire and Hildy respectively, and Chip gets to meet Hildy's nasally roommate Lucy Schmeeler (Alice Pearce). Gabey does track down Ivy and a serious romance ensues as they reconnect with Chip, Ozzie and their girls. The wild night progresses from the top of the Empire State Building to a variety of nightclubs, ending with a madcap police chase across the Brooklyn Bridge and into Coney Island. An adaptation of the war-time stage musical, On The Town is revitalized for the screen with on-location shooting (unique for the time), a largely new musical score, and high energy dance numbers. Most of Leonard Berstein's songs for the stage production were dumped in favour of more upbeat material by Roger Edens, as co-directors Gene Kelly and Stanley Donen start pushing to define the boundaries of the new form of screen musical that will take hold in the 1950s. The dancing is high tempo, athletic and mixed with large doses humour, Kelly getting the flamboyant best out of Vera-Ellen and Ann Miller. The highlights include the opening number New York, New York, as the sailors start their shore leave, and the quite hilarious Prehistoric Man with Claire wrapping Ozzie around her finger as Ann Miller tap dances up a storm. The aggressive Hildy finds all sorts of reasons for Chip to abandon his tour of the city and instead Come Up to My Place, while Gabey and Ivy imagine a small town date on Mainstreet. Vera-Ellen features much more prominently than her sixth-ranked billing suggests. She shines as the multi-talented Ivy in Gabey's Miss Turnstiles imagination before he even meets her, and again dancing with Kelly in the dreamy ballet sequence. As the day draws to an end the energy of the movie just gets stronger, the screenplay by Adolph Green and Betty Comden drawing inspiration from all that New York has to offer to maintain momentum. The sub-text of man-hungry women like Claire and Hildy hunting down the sailors is somewhat surprising, but likely linked to the war-time origins of the musical, with men absent from the home front and women doing their duty to entertain those on leave. A clever tour of various nightclubs adds more humour and builds the romance between Gabey and Ivy to a crescendo, complete with a Cinderella-style runaway lover close to midnight. With a compact running length of just under 100 minutes, On The Town turns into the perfect day in the big city, and a perfect musical experience.